Last Sunday I had a relaxing morning, went out to the old city, I wanted to visit the recently built big synagogue built on the site of a famous one destroyed in wars from long ago, but it was shut so this is for another day. King of Kings Church was really good, great teaching as usual from Wayne Hilsden and some great worship music too. 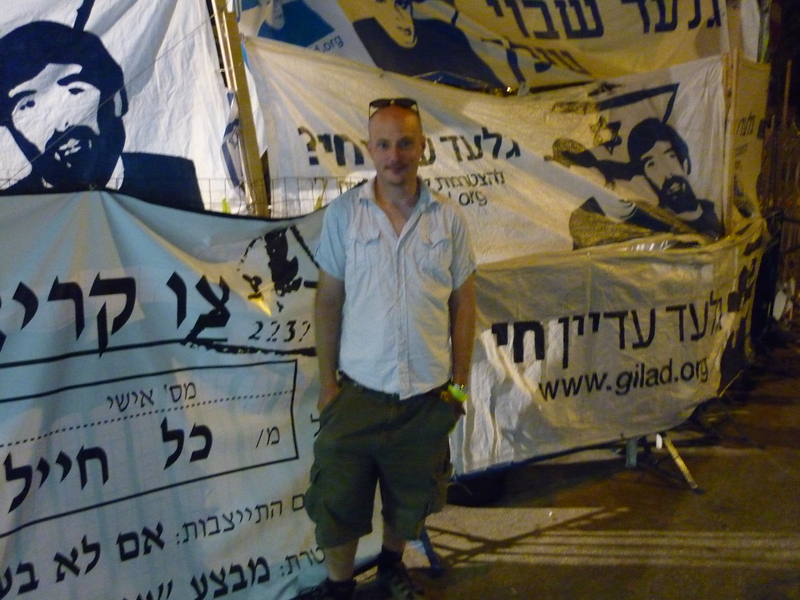 After church, I went with my Arab believer friend as he said there was some special event happening at the Gilad Shalit tent. There is a tent usually manned by two people with various pictures and news stories about the young soldier currently being held captive somewhere in the Gaza strip. These days this street corner has got bigger as news last year confirmed that Gilad is still alive, verified by a videotape of him with a recent newspaper last year. 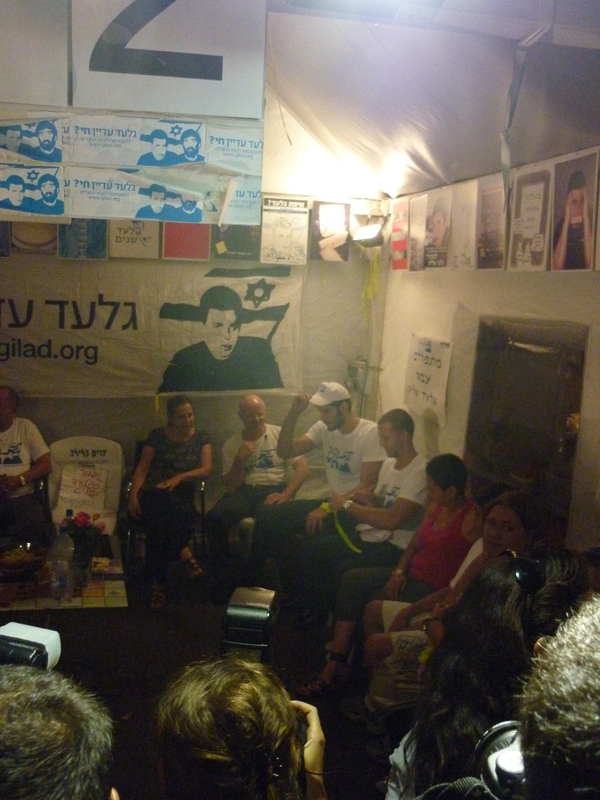 This sunday evening was extra special, there was a TV interview being held with Gilad’s parents and brother and a famous basketball player (I didn’t get his name) who came to show his support. The tent is positioned close to some government buildings. Anyway I am not sure exactly what is said as there was no English posters or spoken announcements. But it is quite sobering to see something to see events shown on worldwide television and being actually there. 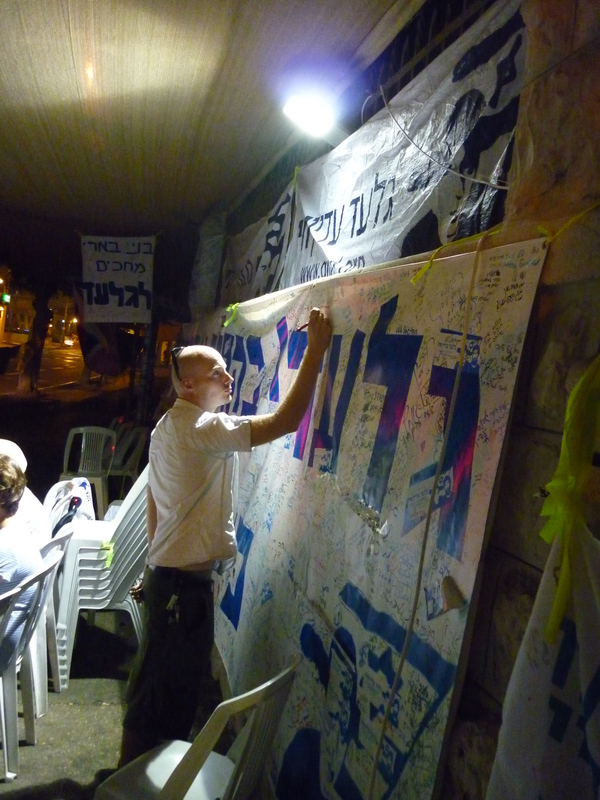 There are several very very long posters signed in a mixture of Hebrew and English there. There were people opposed to event. I am not sure what was said but someone stopped outside in a small Hyundai hatchback and yelled something probably abusive. Across the road was another protest which someone told me was to stop the government making a deal to let out I think something like 1,000 Palestinian prisoners from Israeli jails in exchange for this one solider. If you are reading this, doesn’t matter if you are Jewish, Christian or whatever, please consider praying that this young soldier gets released without any negotiations to release terrorists. By not negotiating with these kind of deals this halts the incentive for future possible kidnappings. In the past some people like Terry Waite, a British Christian author and humanitarian was free after over four years in jail in Lebanon, and a similar thing also happened John Macarthy so I think there is hope. I like your blog and am really flattered you’ve linked to mine. I shall reciprocate. I hope to blog about Christian philosemitism from time to time – it’s an interest of mine. Hello Daphne, I am about to blog about the concluding part of Gilads release tonight, hope you are well.